If you are even passingly interested in Inq28, you almost certainly know the name Neil101. 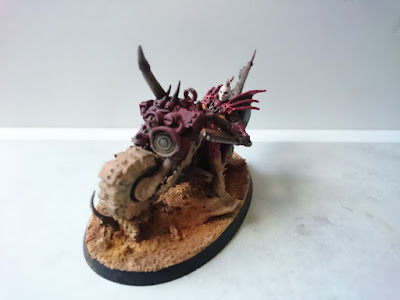 He has been actively involved in too many narrative 40k games to count, including the legendary Yggdrasillium Pillgrimage and Arkke Wald, many of which were documented on his excellent, but sadly closed blog Opus Maius. Fortunately he has revived an old blog, Distopus, to showcase his recent projects and document older ones. Neil stands apart from most hobbyists in that he is a master of not only building fantastic models, but also creating some of the most ambitious terrain anywhere, all the while writing incredibly evocative stories. He showcases all of these strengths in his series: Ages of Darthur, which is compiled here. It follows the turbulent life of Inquisitor Darthur, giving one an unparalleled vision of the man through a trifecta of narrative, models, and terrain. For each of 8 “Ages” there is a short piece of narrative, giving a glimpse of Darthur’s life. Accompanying each piece is a model depicting Dathur from that period, alongside a piece or two of terrain, completing the vignette. The result is spectacular, yielding some of my favorite models of 2017, depicting the rise of a frail interrogator, to a fully-fledged inquisitor, then the slow devolution to radicalism, and finally old age and reflections on how his legacy would be remembered. Every element of the project is excellent, but what shines most is the writing. Neil has a minimalistic style that does not explicitly provide the context of the story, allowing it to slowly show through from the eyes of Darthur himself. It harkens back to Dan Abnett’s excellent Eisenhorn trilogy, showing us that Inquisitors do not need to be caricatures, as is often the case in GW’s codex books, but can be interesting people with feelings, motivations, and struggles. When discussing Neil’s work during 2017, we would be remiss to not mention his remarkable diorama depicting John Blanche’s iconic Sisters of Battle piece first seen on the 2nd edition codex. 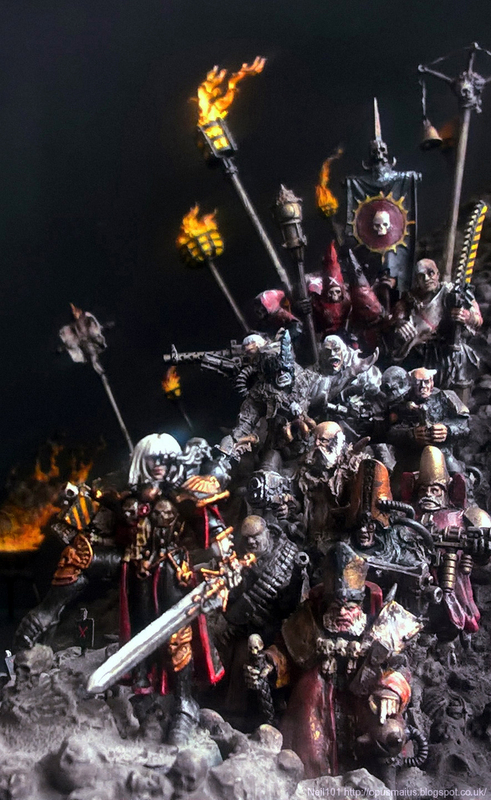 Although centered around the Canoness Veridyan model that was released this year, she pales in comparison to the incredible scope of the piece, with each ecclesiarchy member and zealot behind her painstakingly crafted and set atop a veritable mountain of skulls. To put it simply, Neil101 is still a master of his craft. Here at Between the Bolter and Me, we are always on the lookout for nice Ultramarine models, since they often attract the ire of many hobbyists for their overuse by Games Workshop. We are pleased to have discovered Paul-Friedrich von Bargen’s Ultramarine force this year (along with his excellent blog, Fummelfinger). Each model in his strike force is expertly crafted and unique in build, using components from across the space marine range. While it would have been easy for him to create his marines solely from the excellent Primaris marines, he created each suit of armor by combining components from multiple armor types (and completely resculpting sections). This does wonders to emphasize that each of the models represents a mighty hero of the Imperium! He has an impressive knack for striking the perfect balance between hulking behemoths and agile killers. His sublime conversions are complimented with a gritty and beaten paint scheme reminding the viewer of their grim profession (we particularly love the legionary who is missing his left hand). In addition to his Ultramarines, Bargen also converted and painted an excellent Death Guard space marine in response to the Make Death Guard Great Again challenge that we held on Between the Bolter and Me. When Games Workshop first released Age of Sigmar, it was a liberating feeling. Freed from the Old World, GW had free reign to reexamine and re-envision all of the standard fantasy tropes that permeated through the IP. A few years later, it still feels like they have hardly scratched the surface of the new Mortal Realms. Thankfully, rather than waiting, hobbyists are creating their own lore to fill the void (spurred on in no small part due to Ex Profundis’ AoS28 movement). Few people embody this sort of creative genius as well as Hagen from the PINXIT blog, who created an order of warrior-monks called the Luminarchate, who worship Alluminas, one of the lesser Chaos gods who works to undo all of the actions of the other (greater) Chaos gods. As such, this esoteric order works to oppose change in all of its forms, mimicking the stagnant Mechanicum in 40k. Accompanying this thought-provoking background are some of the most well executed conversions you will ever see. Beginning with wonderful concept sketches, Hagen then meticulously crafts his models, splicing together countless models with such grace that you would be hard pressed to realize they are conversions at all. 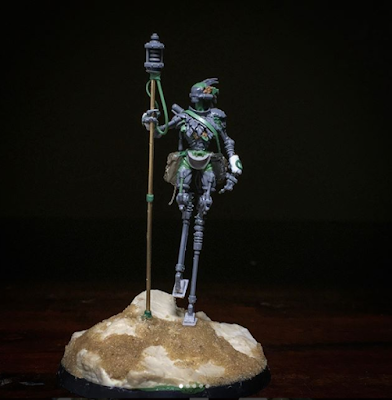 His Alluminarch, leader of the Alluminarchate, is breathtaking, combining parts from genestealer cultists, Skitarii rangers, an Eldar farseer, MKIII Iron Armor, and more. 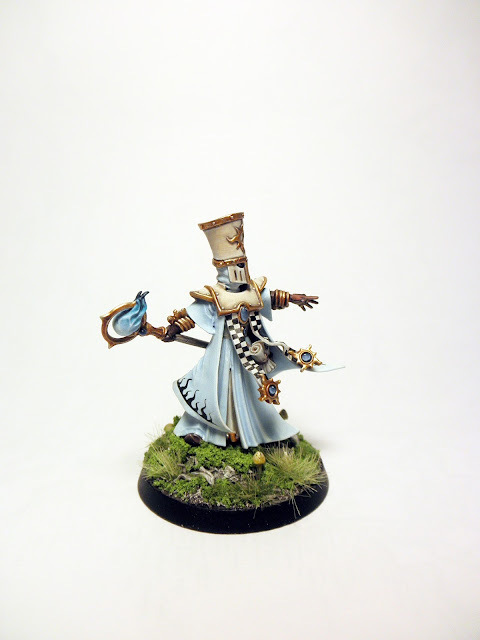 Coupled with a simple paint scheme of white and gold, the model may be the best AoS we have ever seen, rivaling all of the models GW released. Hagen has many other fantastic projects too, including a tribal warband called the Sons of Or, who have a native American aesthetic that looks quite distinct from other warriors in the Nine Realms (in the very best way possible!). As an accomplished sculptor, converter, painter, illustrator, and writer, we strongly encourage you to visit Hagen blog! We cannot wait to see what 2018 holds for him! In the 5 years we have run Between the Bolter and Me, we do not think we have seen someone with as much raw and unrestrained talent as the Polysmith. Saying anything less than that he is a visionary when it comes to building 40k models is a gross understatement. 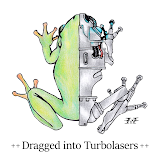 Never one to be hindered by 40k tropes and design language, he splices together innumerable kits, taking the smallest unremarkable elements and repurposing them to build fantastic models, many of which are robots of all shapes and sizes. He builds his models with the precision of an engineer, artfully using green stuff and his skills at digital sculpting to aid his work. Honestly, we cannot really do his work justice with words and suggest that you see his work yourself either on his blog, or via Instagram! Many hobby blogs have a relatively narrow focus, such as converting or painting small warbands or reviewing new products, allowing them to more easily generate content that fits their specialty. 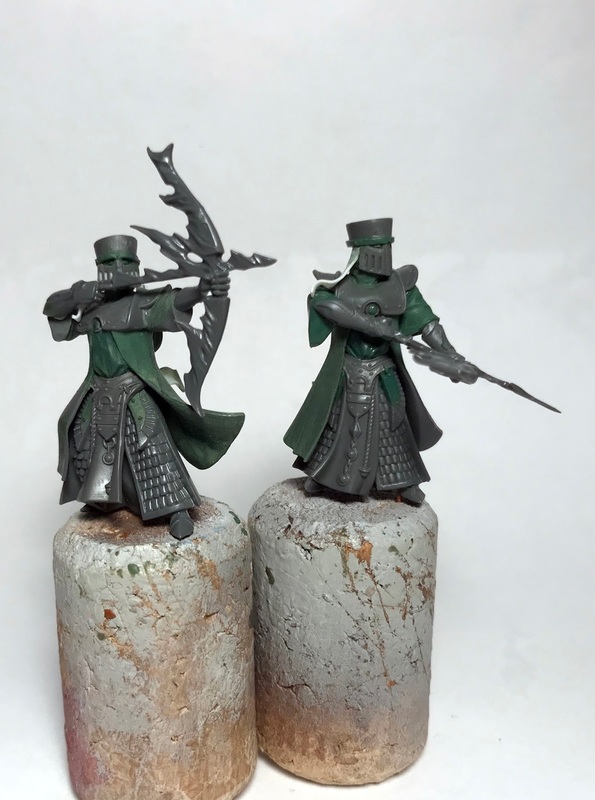 Wudugast’s excellent Convert or Die is the rare blog that throws this model to the wind, creating an incredibly diverse selection of posts, ranging from insightful examinations of new models, building armies, converting models, and creating Inq28 warbands. In an age that is becoming increasingly dominated by social media platforms, Wudugast’s commitment to writing comprehensive and astute explorations into Games Workshop’s new model ranges is very welcome. 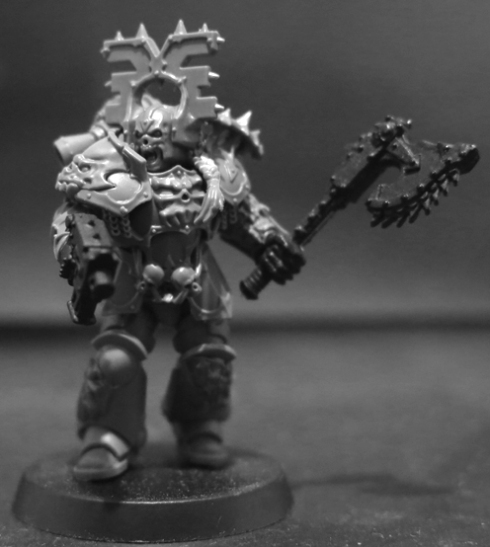 He has a particularly good look at this year’s Death Guard releases, complete with a host of pictures showing how GW models’ scale has changed over the years. He also writes excellent introspective pieces looking at elements that define Games Workshop’s settings, such as an examination of what makes Chaos so interesting and important for their IP as a whole. When deciding to take part in Iron Sleet’s Invitational this year, he used it as an opportunity to delve into how the harsh regime of the Imperium shapes (or should shape) the Imperial Guard. Although he has built many great models in 2017, our favorite is likely his first Khorne Berserker, built eloquently using a Primaris Space Marine and pieces from an AoS Blood Warrior. The added height imparted from the anatomically sound Primaris space marine legs does wonders to create an imposing warrior of the Blood God! When thinking about people pushing the boundaries of narrative gaming and bringing the hobby community closer together, it is hard to not think of Alexander Winberg. In addition to being a terrific writer and modeler, he was one of the principle masterminds of the narrative spectacles Outgard and Tor Megiddo. Both saw a multitude of remarkable hobbyists from around the world converge in Finland to help weave incredible emergent stories. For both events he played a major role establishing the settings, a sepulchral planet stuck in the Dark Ages and a sun-bleached desert wasteland respectively, writing many evocative pieces of fiction that did more to get you invested into Warhammer 40,000 than any codex books have for a decade. His writing is concise and imaginative, eschewing verbose prose in favor of direct, almost scriptural language, allowing the reader to get pulled into the narrative. His talent for writing bleeds into the models he makes as well, with every detail considered and purposeful. His two growing AoS28 warbands, the Black Sun Compact and the Cardinal Church, are a good example of his vivid imagination and desire to explore the dark corners of Games Workshop’s settings. To our delight, Alex and the seminal Alexander Lunde started a blog to showcase their work, Echoes of Imperium, making it easier than ever to follow their work! 2018 is already looking to be an exciting year for Alex, with him joining the Nestorian Infestation and the enigmatic Rhossum Secundus project. It is no secret that we at Between the Bolter and Me like to impart as much realism into our models as possible, paying close attention to scale and preferring somber gritty tones for our painting. SLMNN, arbiter of the wonderful blog Accipiter Nidum, is a kindred spirit in this regard. 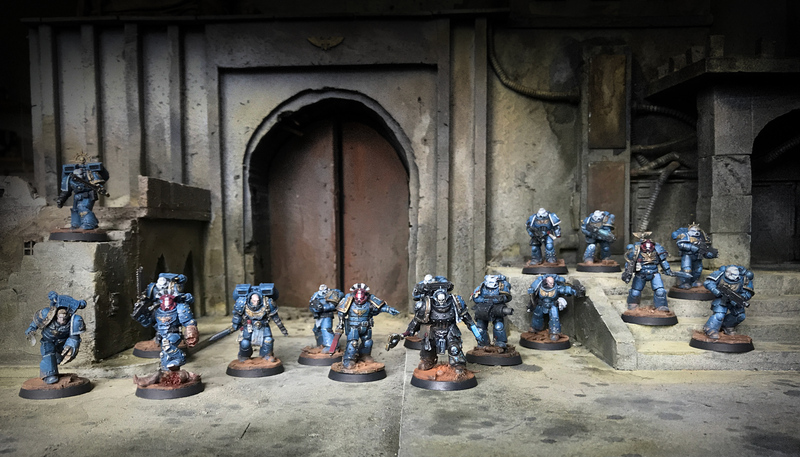 SLMNN creates models in the vein of Dainton, Kopinski, and Boyd, incorporating many classic, yet incongruous, elements of 40k together seamlessly, while naturally incorporating ideas of his own. He does an excellent job of infusing the gothic elements of 40k into his models without going overboard, maintaining a sense of believability. 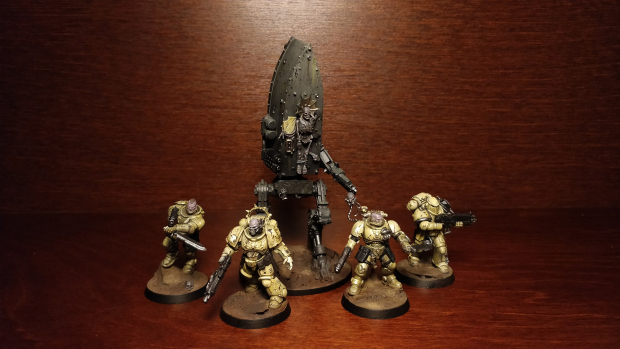 Taking advantage of the new Primaris models, he created some of the most striking Imperial Fist models we have ever seen, painted in a dusty pale yellow that speaks to their life of endless bone-grinding war. And walking within their midst are these fantastic Reclusiam Engines, towering above even the Astartes. 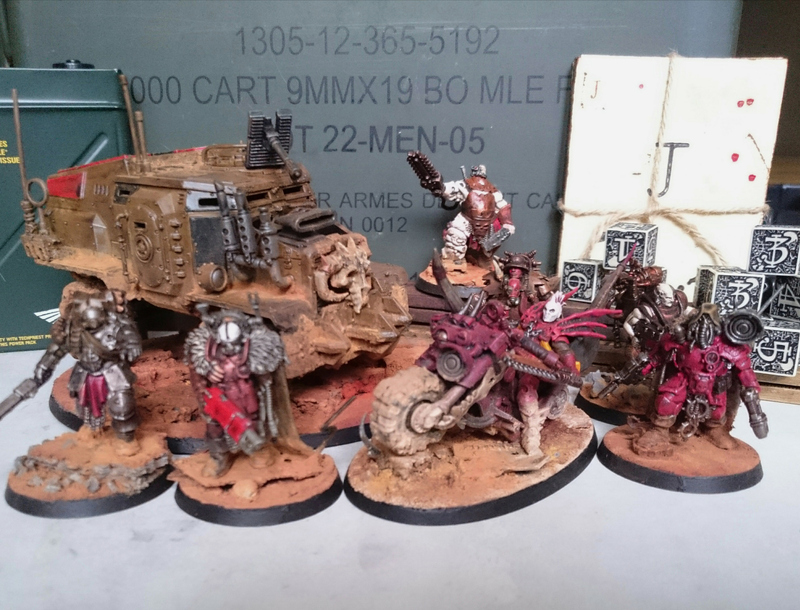 Recognizing the power of scale, he has created a host of mechanized Imperial Guard based on the Forge World Death Korp models. 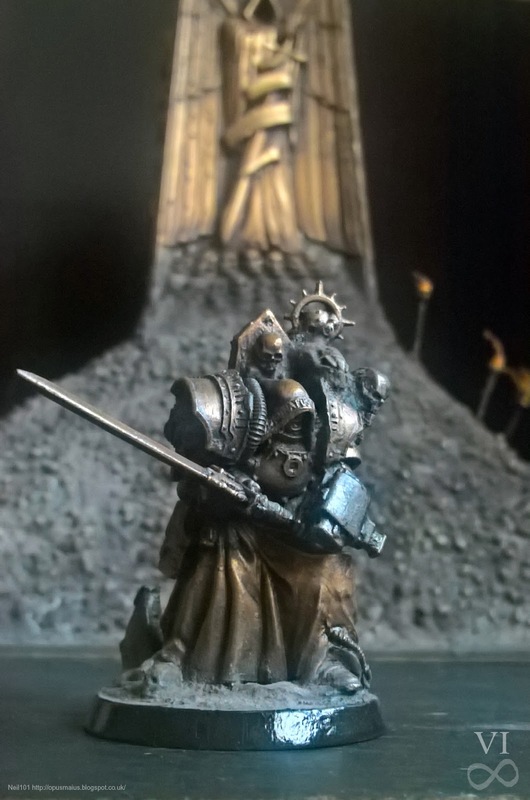 Being slightly smaller than most of GW’s other Imperial Guard models, the Death Korp models allow the Astartes to tower above them, emphasizing the vast divide between Adeptus Astartes and Homo sapiens, and strengthening the visual contrast between his models. Rather than having half-tracks for mobilization, SLMNN created bipedal walkers reminiscent to AT-STs. Like the Imperial Fists, the Guard are painted in a drab and weather beaten scheme. 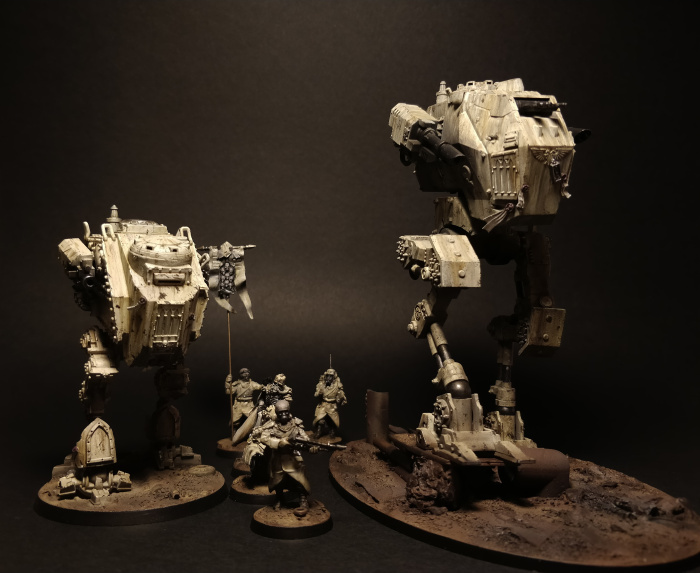 The walkers are particularly impressive, with excellent streaking and other weathering techniques. The color schemes are simple, yet they remind us that war is Hell, with no glamour in it. 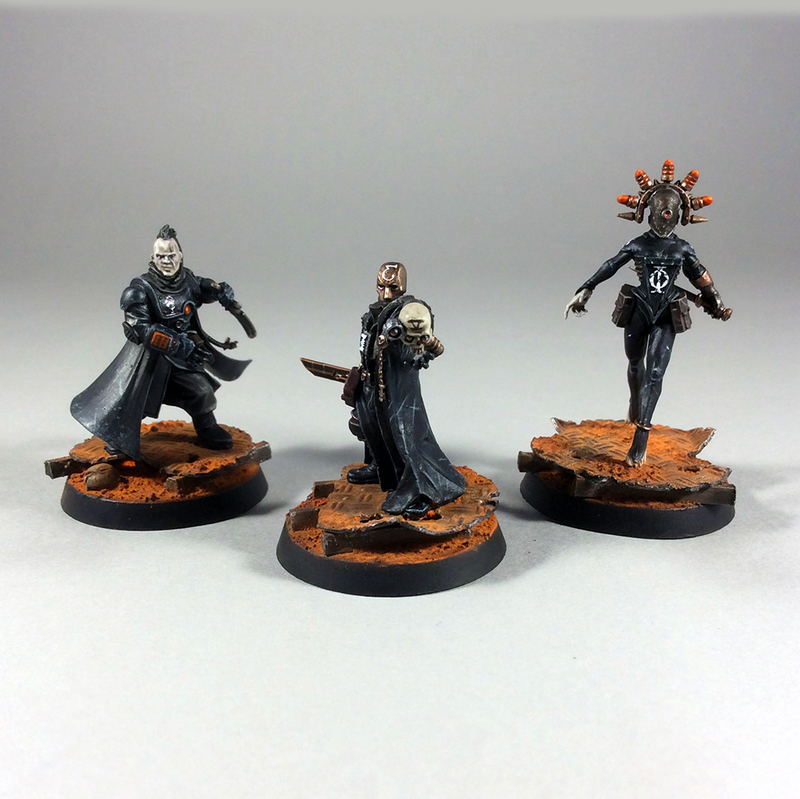 Back in 2015 Iron Sleet’s first Invitational spurred many hobbyists back into action (including Adam who painted his first models after more than 6 years), including the incredibly talented Leadbelly where he created Carcosa, a former Inquisitor of the Ordo Chronos lost amongst the maddening tides of the Immaterium. Fast forward two years later and now Leadbelly has started his very own blog, Leadbelly’s Forge! While the blog is still young, it started in a large way by making a remarkable band of warriors for the second Iron Sleet Invitational. When first seeing the models, we were immediately stuck by the weather beaten paint scheme that creatively experiments with texture and drab hues, while injecting a hint of vitality with the subtile inclusion of greens. Each model is also quite unique, from the two battered Sheildbrothers’s with corroded swords, to the diminutive robotic snail construct. Our favorite, however, is Horgraive Snake-Eater. His excellent pose, coupled with the stern look on his face, makes him seem like a gunfighter reminiscent to the Man with No Name or Revolver Ocelot. 2018 is already looking to be a strong year for Leadbelly, as he hints at the next project Gromniguld. Make sure to follow him on Instagram to get a steady stream of great conversions! What initially attracted us to Inq28 was its focus on the often overshadowed human element of Warhammer 40k and how the harsh realities of a galaxy at war take their toll on humanity. These sentiments are perfectly embodied in the work of Matt Byrne and his excellent blog Dark Places. In response to the Iron Sleet Thorn Moon Invitational, Matt created a group of Imperial Guard from Azar Prime, a desert planet contaminated with severe radiation poisoning. The Imperial Guard from the planet, the Azari Petitioners, fight for the Emperor’s glory and a chance to escape the brutal embrace of the radiation-choked wastes of their homeworld. To represent the toll the planet has taken on the guard, Matt cleverly repurposed the heads of the Dark Imperium Poxwalkers (quite possibly the best use of the Poxwalkers we have seen yet). If the radiation burned faces were not enough, he carefully spliced the heads with the lower halves of Skitarii Vanguard models to represent rebreathers. Thoughtful modifications like these do wonders to sell the concept of the regiment and build their character. 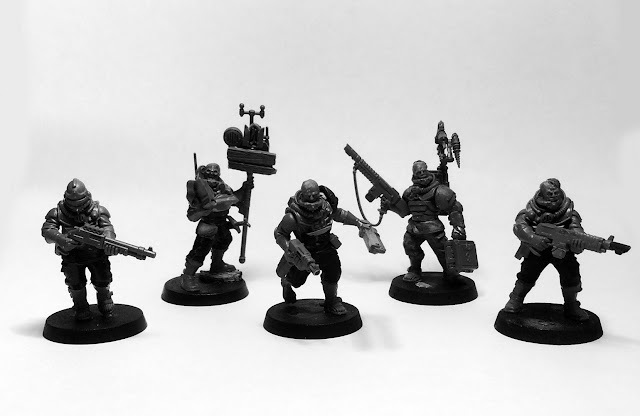 Additionally we were delighted to discover that he replaced the boots on the Cadian legs he used with smaller less bulky ones from the Genestealer cultists, a modification right in line with something we would do here on Between the Bolter and Me. 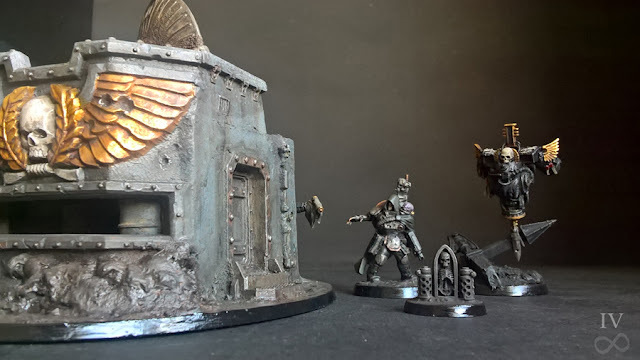 Further exploring the human side of the 40k universe, Matt is in the process of developing the background for and converting Inquisitor Udo Motya and his retinue. The group is only three models strong thus far, but each makes a very strong and memorable impression. Each member is painted almost exclusively with blacks and dark greys allowing for a really striking contrast for elements such as skin and bionic eyes. Do yourself a favor and start following the blog and him on Instagram! Thanks for taking the time to read this post; we hope you discovered one or two new hobbyists or blogs to follow! Onward 2018! Excellent list – and article. Thanks for taking the time to compile this. Thanks for taking the time to read it! 2017 was a remarkable year and this seemed like a small way to celebrate that! Great list guys, so many talented hobbyists! Really good to see newer faces and a few not so new who haven’t been pulled into the spotlight yet! Thanks! It was great to compile it and reflect on all the great models that were made over the year. Abosutley stunning selection of gw model mastercraft ._ completely humbled to be amongst such good company. Thank you . I couldn't imagine the list without you! Glad you are back making models again! Thank you very much for posting this list. I’ve been following several of these excellent artists for a while. I hadn’t heard of a few of them and I was pleasantly surprised by their work. I’m following all of them now thanks to you bringing them to our attention. I am glad you found a few more blogs to follow! Wow, thank you very much for the kind mention! It is really inspring to see so much awesome creations these days. I cherish these overviews – i always discover a new modeler who i didn´t knew yet. Your amazing work made you an each choice for the list! It was great putting the list together, reflecting on all the great models that were created over the course of 2017. Thanks for the run down. I'm at work so this is my only 40k while I either away, lol. 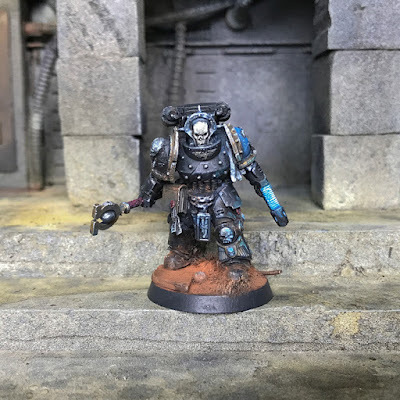 I am glad the blog is helping you stay engaged in 40k despite being so busy! Thanks so much for featuring me guys - It's a real honour to be mentioned alongside such amazing hobbyists! 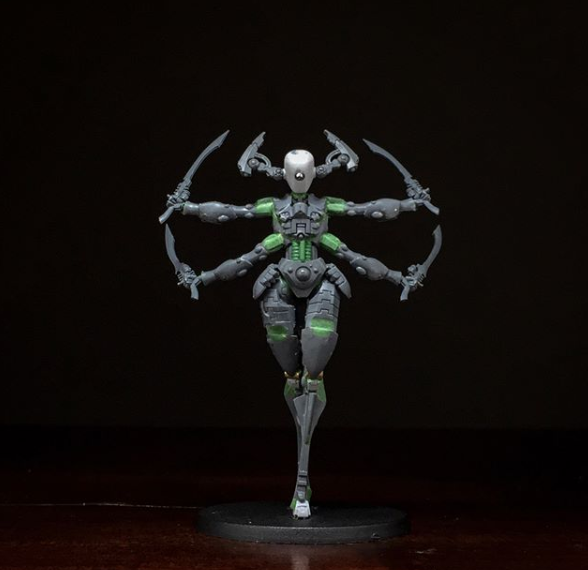 Thanks for taking the time to blog and share your awesome models! Glad to hear this helped you find a new blog or two! And keep up the great work! Thanks for posting this list, there were a couple I had not seen before! Glad it helped you find a new blog or two! Thanks for taking the time to put this together, guys. There's a lot of great new stuff here that I wasn't familiar with. Thanks for reading it, and I am glad you found some new blogs to follow!